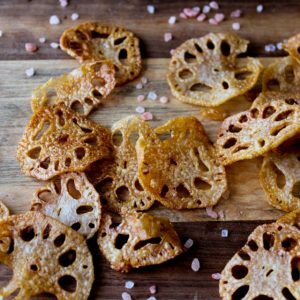 These unique looking lotus root chips, look fascinating and taste even better. Something fun and different from the everyday potato chip! Careful with these ones, they are very addictive! Lotus root is one of those weird ingredients that I never really knew what it really was until my late 20s. My parents would put it in soups and I would just eat it – no questions asked. It was odd, when you bite into it and pull, it has these really fine silky spidery web hairs that pull out of it. A very odd experience. In the wild, the lotus roots live underwater and are the root system of the beautiful pink lotus flowers and their pods. Its texture is crisp like an apple but tough to eat in big chunks raw because of the density of silky webbed hair roots within the actual root. It actually doesn’t have a very strong flavour, just a hint of sweetness. Its most common use in Asian cuisines are in Asian broth soups or stir fries, but being the adventurous and curious person I am, I decided to deep fry these pretty little things. 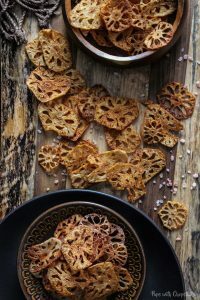 For this lotus root chips recipe, you can find the ingredients at an asian supermarket to find it. When you are buying it, make sure to pick the ones that are very firm (like a potato) and light pinky beige in colour. Try to stay away from the black, brown very blemished soft ones. Storage : Keep these little guys dry, else they will rot easily. I personally enjoy the natural flavours of this, so I only use salt on it, and to be honest they are tasty unsalted too. You can add in spices such as cumin or five spice to give it a bit of oomph as well. Flavour Profile : Mildly sweet when raw, taste like a potato chip when deep fried. 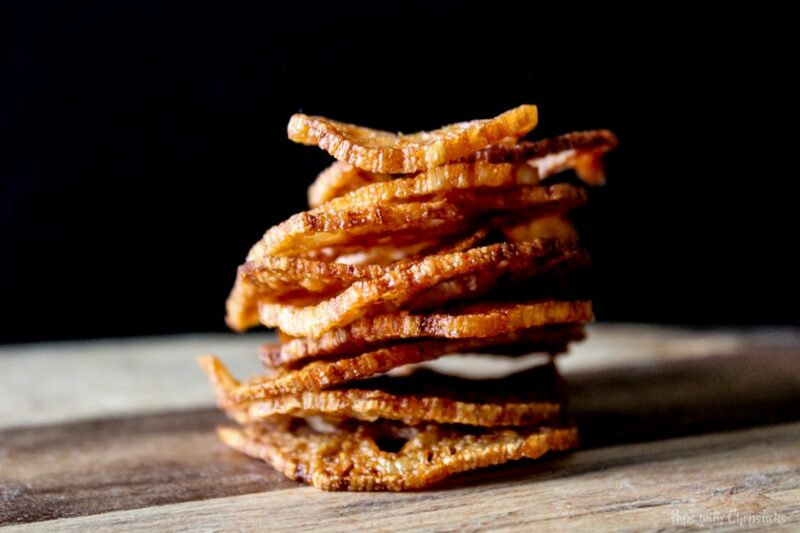 Tip #1 : After cutting the chips, you can make them extra crispy by soaking them for a few minutes in a small bowl of water with 1 tablespoon of vinegar. Just make sure you dry them very well before deep frying them or baking them. For this recipe I baked and deep fried to show you the difference between the two processes and which one we preferred. You must watch the oven like a hawk, when these babies burn – they burn FAST. Deep frying wins this one for me. There’s less baby sitting of the oven, more evenly cooked and quicker to make. I know most of us hate deep frying, but since these chips are thin you actually don’t need to go nuts on the oil! 🙂 You can use a frying pan with 1 cm of oil and deep fry them in small batches. 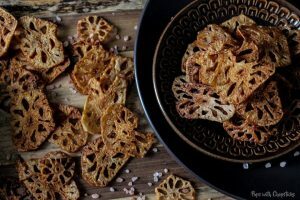 These unique looking crispy lotus root chips, look fascinating and taste even better. Something fun and different from the everyday potato chip! Careful with these ones, they are very addictive! 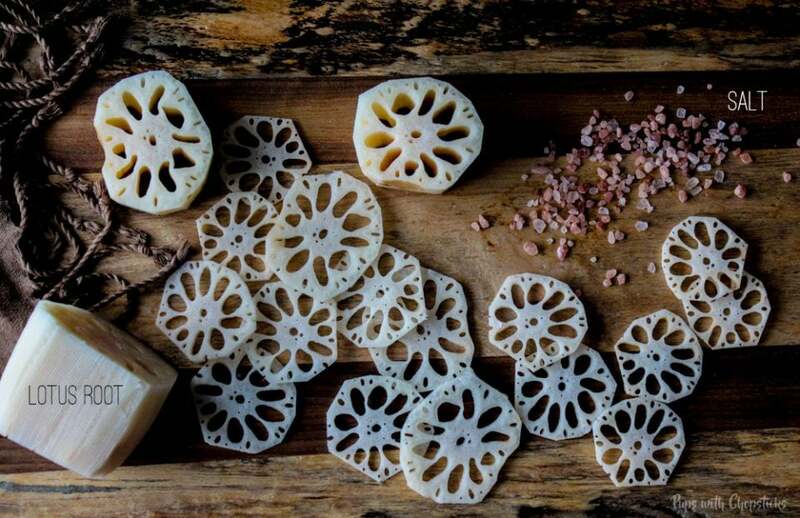 Depending on your preference, peel the lotus root or leave it un-peeled. If you are using a deep fryer, set it to 350F (176C). If you are using the stove, add approximately 1 cm of oil into the pan and set it to medium heat. Oil a baking sheet and put the lotus root on in a single layer. Bake for 10 mins or until golden brown. (Watch the oven like a hawk, every oven is set differently and these little guys burn quickly in the oven) They won’t crisp evenly, so you should remove the browned ones and put the rest back into the oven. Serve immediately. They don’t taste as good the next day. After cutting the chips, you can make them extra crispy by soaking them for a few minutes in a small bowl of water with 1 tablespoon of vinegar. Just make sure you dry them very well before deep frying them or baking them. i recently had a few crushed on top of poke, and that texture was amazing! super light and crispy with the silky fish; i’m craving it right now! (so much so that i have plans to get poke for lunch tomorrow lol). These look SO fun, Joyce! Thanks for sharing! This recipe makes me so happy! 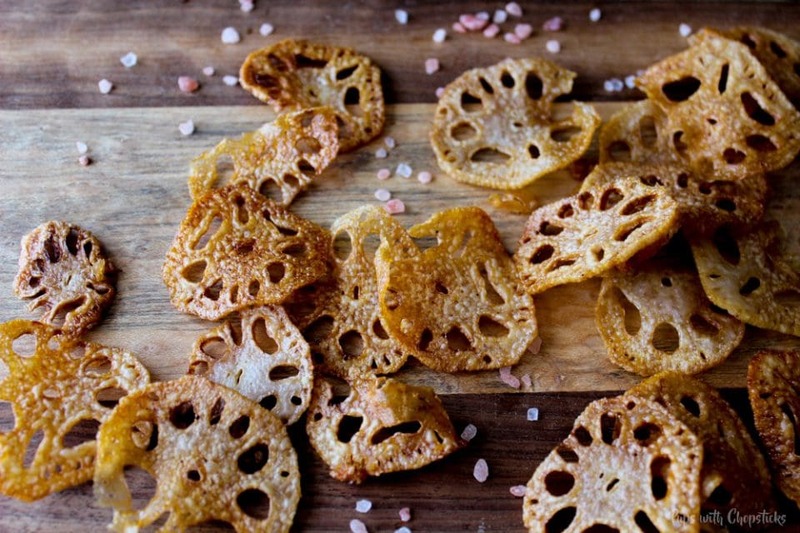 I love lotus root chips, but I only really eat them in Asia. They’re hard to find in the U.S. Now, I can make them at home! Love that you offer two different cooking options too! There’s a super awesome vegetarian Japanese restaurant where I’m from and they make tempura with lotus root! It’s amazing. I don’t normally like to eat it but when fried I’ll take it :p These look so good! Deep fried wins over baked for me – no contest. I would have fallen into the thinner is better trap for sure. 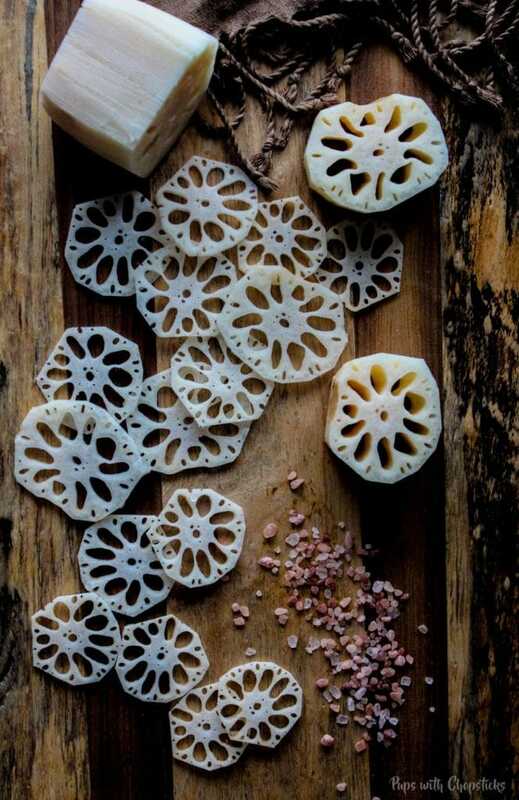 I don’t have a lot of exposure to lotus root myself but this makes me think a trip to the asian market is in order. I’ve only had lotus root boiled in soups and I like it a lot, but fried lotus root sounds even better! What a creative idea. I also like how the pattern of the bowl that you used matches with the lotus root! Lovely pics as always. I’m sure I’ve had lotus root at restaurants, but never really thought about it. Thanks for sharing more about it, it was really interesting. 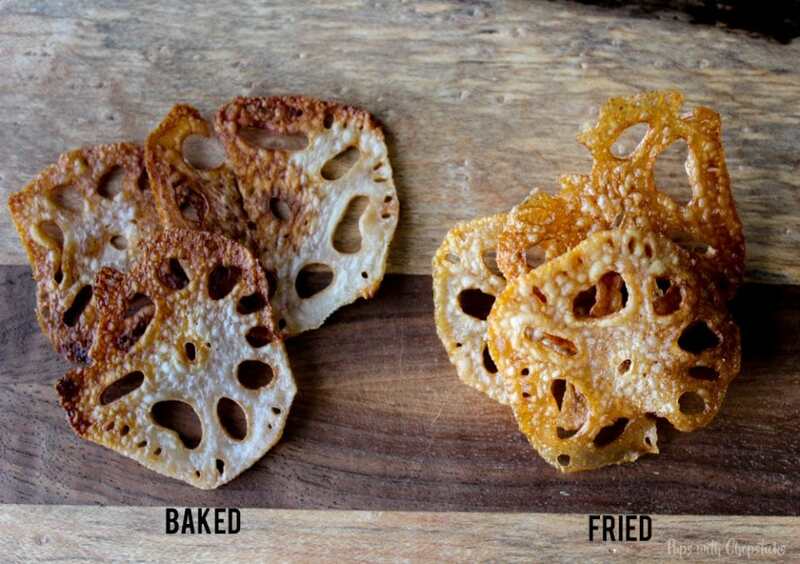 And even just looking at the comparison, I’d go with deep frying too!! I’m so glad you found it helpful! 🙂 I would have leaned towards baking but I noticed I was using almost the same amount of oil so I might as well do it the tastier way!